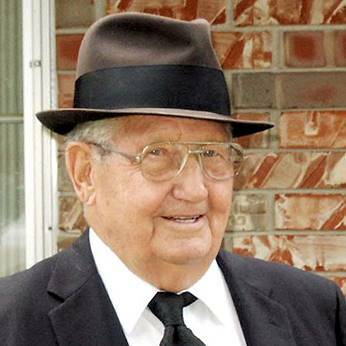 BRISTOW [Creek Co.]—George "Wiley" Alford, 89, electrical business owner, died Thursday. Service 11 a.m. Monday, Hutchins-Maples Funeral Home Chapel. George Wiley Alford died Feb. 2, 2006 in Bristow. He was born in Beggs on April 28, 1916. Funeral services will be held at 11 a.m. Monday, Feb. 6, 2006 at Hutchins-Maples Funeral Home Chapel. Hutchins-Maples Funeral Home is in charge of arrangements. George Wiley Alford was born 28 April 1916 on the family farm five miles west of Beggs, Okmulgee Co., Oklahoma and he died on 2 February 2006 in Bristow, Creek Co., Oklahoma after a short illness. “Wiley” was the first child of Sigmond Wolf Alford and Ruth Elaine Soule. Ruth died in 1918 shortly after the birth of a second son, Chester. “Sig” never remarried and raised the two boys on the farm with the help of his mother, Mary Josephine Chandler Alford. Wiley attended the Osage Hill rural school through the eighth grade, and then helped full-time on the farm until the depression of the 1930s provided him an “opportunity” to migrate toward California. In 1937 he married and headed west until he found work on the railroad in Arizona. His marriage and his interest in the desert environment both ended, and by 1940 he was again single and back in Beggs. In early 1941, Wiley tried unsuccessfully to join the Army Air Corps. However, two days after the attack on Pearl Harbor, he was drafted into the Army and subsequently served 46 months in the European theatre. After the war he returned to Beggs and on 19 January 1946 he married Naomi Ruth Wasson nee Askew at Okmulgee, Okmulgee Co., Oklahoma. Naomi (1918–2003) was born at Nashville, Howard Co., Arkansas, a daughter of Clarence H. Askew and Vera Del Greene. Her first husband was killed in Italy in 1944 leaving her with a young son, Ronald Edward Wasson, Jr.
Wiley began his career as an electrician working as a telephone lineman for the Pure Oil Company. He did a variety of electrical work around the oil fields of north central Oklahoma for 16 years, and then he started his own business in 1962, Automatic Controls Service, at Bristow, Oklahoma. He and Naomi, who worked as bookkeeper, were very successful with this venture until their retirement in the 1980s. 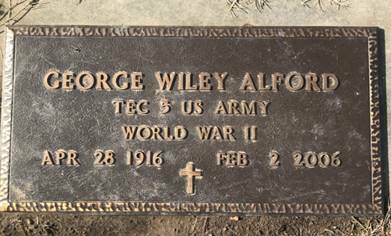 Wiley was buried in the Alford family plot in the Beggs City Cemetery. He is survived by his step-son, two step-grandsons, and two nephews. AAFA NOTES: SSDI records confirm the birth and death dates of George W. Alford (SS# issued by the Railroad Board), last residence Bristow, Creek Co., OK.
His lineage: George Wiley 1916 OK1, Sigmond Wolfe 1886 AR2, George Wiley 1838 NC3, Green 1810 NC4.